BigBang's Seungri has started promoting his Asia concert tour on social media, despite a police investigation into a club he once said he was in charge of. 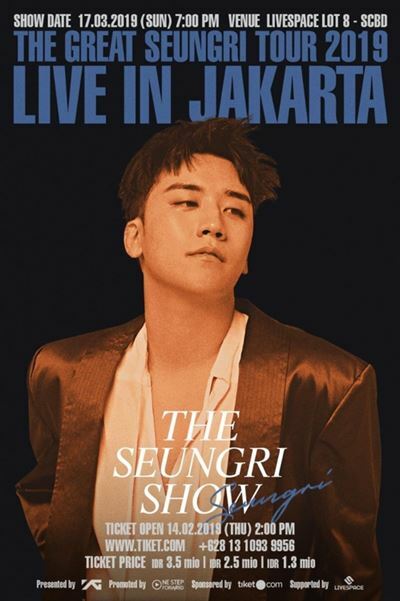 Seungri posted an image to promote the tour of four cities ― Seoul, Singapore, Osaka and Jakarta ― on Instagram Friday. But the timing of the posting ― a week after shocking revelations of "drug parties" and "sexual assaults" allegedly committed at the Burning Sun club ― raised many eyebrows. The scandal began with media reports about a man who claimed to have been assaulted by police and club employees in November after trying to protect a woman who was being sexually harassed. Other allegations, including turning a blind eye to drug parties and sexual crimes against female customers, were then raised against club management and Seungri. Seungri, who previously introduced himself as the "owner and manager" of the club on TV shows, apologized on Feb. 2 and claimed he was not actually involved in the management. Police are now looking into whether he is part of management and, if so, he was aware of the wrongdoings allegedly committed within the club. The opening of his tour in Seoul ― the last before he joins the military for his mandatory service ― is only a week away, but ticket sales are lower than expected. As of Saturday, more than 400 seats out of 5,000 for the Feb. 17 event were unsold. Some of those who purchased tickets requested refunds following the scandal.